Boss Peanut Butter Cookies - hands down THE BEST peanut butter cookies I've ever eaten! Recipe from The Cake Boss. The secret ingredient makes all the difference!!! Peanut butter, crisco, brown sugar, sweetened condensed milk, vanilla, egg, flour, baking powder, chocolate chips, peanut butter chips. SO soft and delicious. Can make ahead of time and refrigerate dough for a week or freeze for 2 months. These are incredible! 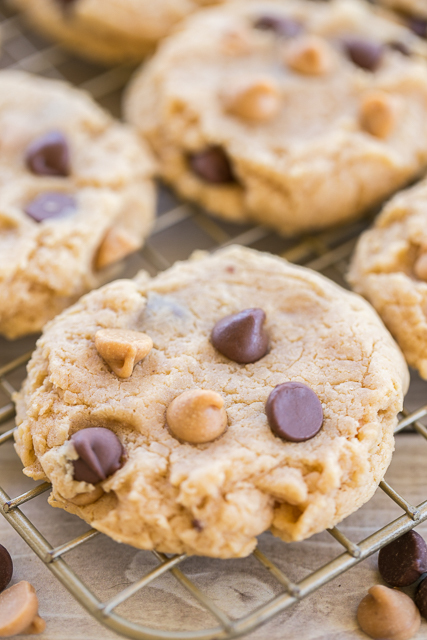 Seriously the best peanut butter cookies recipe! One of our must eat places in Las Vegas is at Carlo's Bakery in The Palazzo. It is the bakery connected to Buddy V's restaurant. In case you aren't familiar with either of these places, they are the restaurant and bakery from The Cake Boss on TLC. I'm not really a fan of the TV show, but I am a HUGE fan of both restaurants! My favorite thing to get at Carlo's Bakery is cookies. They are the best bakery cookies EVER. I'm not usually fan of store-bought cookies, but the cookies from Carlo's Bakery are second to none. They taste as good as homemade. I was looking at some of Buddy V's cookbooks on Amazon and read a review about the peanut butter cookies. The cookbook I was looking at was only $1.99, so I threw caution into the wind and bought it. What made these Boss Peanut Butter Cookies unique (to me) was that they are made with a can of sweetened condensed milk. OMG! I had to make them ASAP. 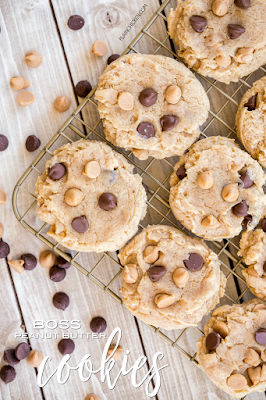 These Boss Peanut Butter Cookies are incredible. So soft and so yummy! I loved the addition of milk chocolate and peanut butter chips. I am a total sucker for anything peanut butter and chocolate, so these were right up my alley!! Give them a try! I promise they will be a hit! Preheat oven to 325ºF. Line baking sheets with parchment paper and set aside. In the bowl of an electric mixer, put peanut butter, crisco, and sugar. Mix together on low speed until creamy. Add egg and mix until combined. Add the condensed milk and vanilla. Mix on low speed for 1 minute. Combine flour and baking powder. Slowly add mixture to bowl, mixing on low for 1 minute. Stir in chocolate and peanut butter chips. Using a medium cookie scoop (2-Tbps), scoop dough and place on prepared baking pans. Slightly press dough down to 1/2-inch thickness. Bake for 8 to 10 minutes, until the cookies are just starting to brown on the edges. Let sit on baking pan for 5 minutes then transfer to wire rack to cool. use any chips you would prefer. Enjoy! I haven't used Crisco in years, can I use butter instead? You can obviously do whatever you want in your own kitchen. I haven't made these with butter, so I can't say how they will turn out.